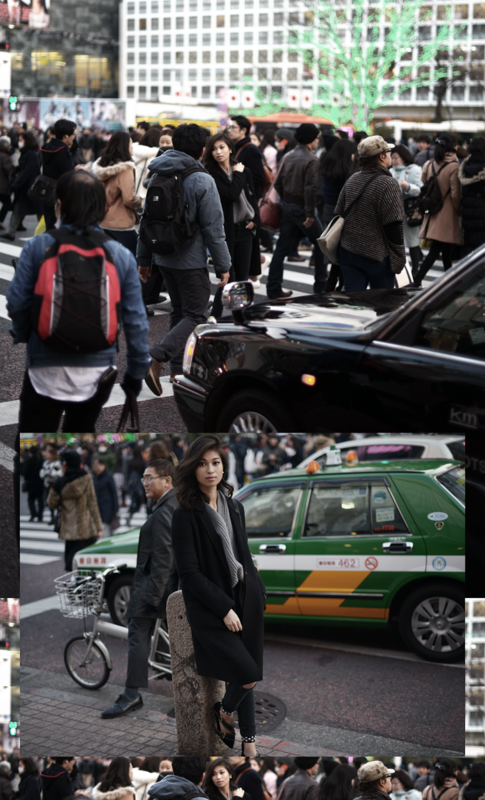 Of all the times I've been to Tokyo, I've never even thought to attempt shooting at Shibuya Crossing. It's one of those places where I've started to avoid like how I avoid Times Square in New York. The intersection is busy, but a really interesting kind of busy. One of the things I've learned, though, is that while Tokyo is crowded, somehow, no one is really ever in your personal space. It's crazy to think with the unlimited options of crossing here, that rarely, anyone bumps into one another and maybe, it's also why this kind of thing only exists in Japan. My boyfriend was feeling a little inspired by the energy of this place and started snapping away while I try to maneuver myself around all these people and colorful taxis. So, as I didn't intend on publishing these photos as this set is a little different from all of my other posts, I somehow find these snapshots really raw and I hope they make you feel that you were somewhat there to experience this organized chaos with me too.